Just like us, pets often need to watch how much they eat. If your pet needs to be on a diet, then consider the Home Intuition Portion Control automatic pet feeder! It lets you measure the exact amount of food required for each feeding, plus it allows you to create a custom schedule so that your pet is fed on time. Pets miss us when we’re gone! Your cat will appreciate the short message that you record, letting her know that her next meal is ready to eat. 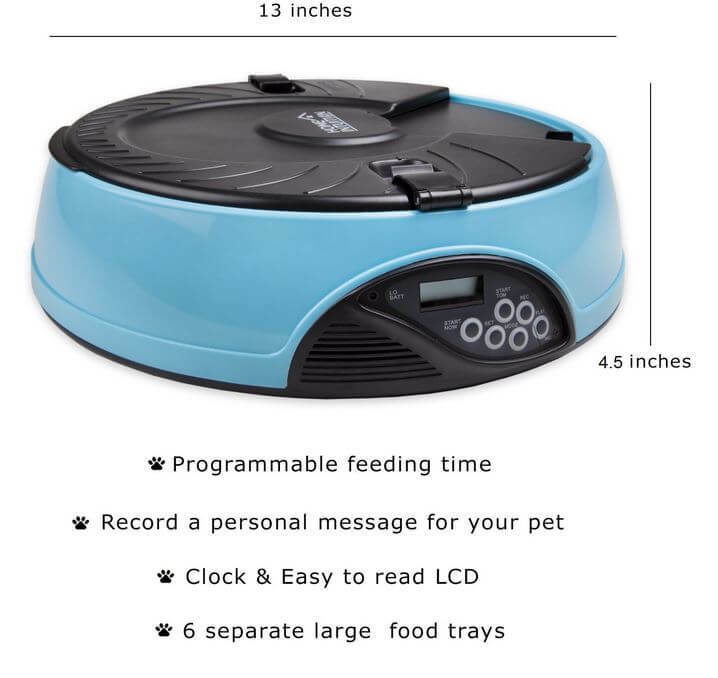 Thanks to a clock, which is displayed on an easy-to-read LCD screen, you’ll have no trouble programming this automatic pet feeder – plus you can see how long it is until your pet’s next feeding. Programming works on a 24-hour cycle, so you can feed your pet once, twice, or more often each day. 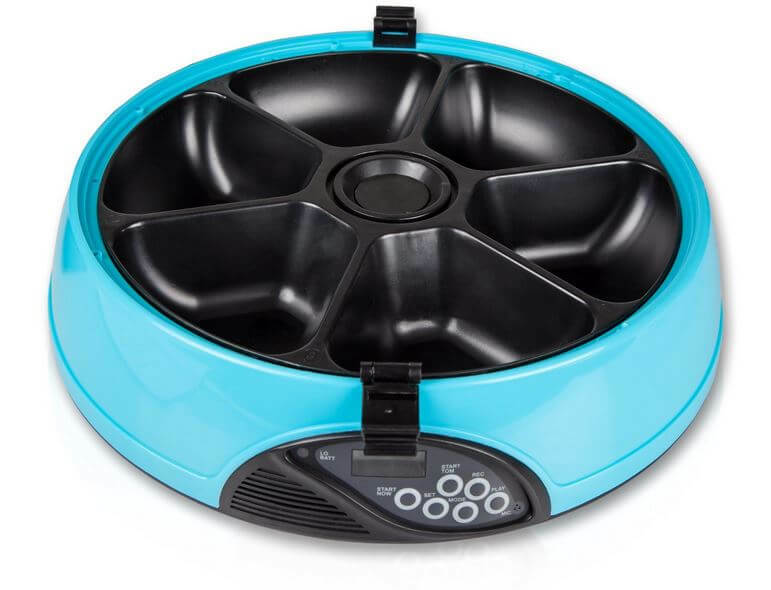 With a diminutive 13” x 13” footprint, the Home Intuition pet feeder goes just about anywhere. Its low-profile design prevents pets from tipping it over, and it is available in your choice of light blue or granite colors. Many automated pet feeders require electricity for operation, so you need to have access to an electrical outlet. This one runs on 4 “C” batteries, so you can place it anywhere, take it along on vacation, or enjoy the knowledge that your pet is being fed even if the power happens to go out. The Home Intuition Portion Control pet feeder features six separate feeding compartments, all of which are securely covered with a lid that opens up to reveal the next meal when feeding time arrives. Since the compartments are not sealed, the Home Intuition automatic pet feeder is intended for dry food only. No. It is sized for a cat or a small dog, and dispenses smaller portions than a large dog needs. Also, if you have a small dog that tends to be rambunctious, this may not be the right feeder. While durable, it’s not too large for a dog to move around. Our cat wasn’t able to get into the feeder, however other reviewers mention that their determined, intellectual cats were occasionally able to beat the system. Battery life depends on a number of unique factors, so it’s impossible to say for certain. Buying good-quality batteries and keeping the feeder in an environment where humidity isn’t an issue are two ways to make sure that the batteries last as long as possible. Yes, you can set it to go off any way that you like within each 24-hour period. No. You need to wash the bowl by hand and dry it thoroughly before refilling it with dry pet food. 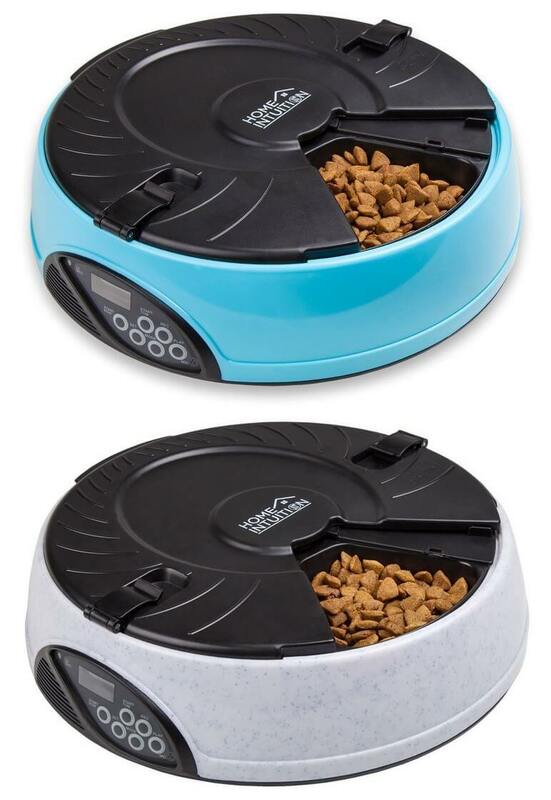 The Home Intuition Portion Control 6-Meal Automatic Pet Feeder offers a simple, tip-proof design, plus it is available in two colors, so you can match it to your interior. You’re completely in charge of filling it with exactly the right amount of food per feeding, and you can program it to deliver as many meals as you like during each 24-hour period. The feeder is battery-operated for go-anywhere convenience, and although it isn’t dishwasher safe, it is very easy to clean after each use. This convenient pet feeder also offers the advantage of allowing you to record a quick message letting your pet know that it’s time to eat. 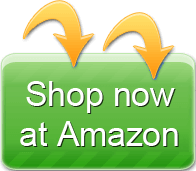 You can find the Home Intuition Portion Control 6-Meal Automatic Pet Feeder for sale at online retailers including Amazon, and although we haven’t seen them for sale at our local pet store or big box retailer, they may be available at select brick and mortar stores as well. I have two of these units. The main problem I have is synchronizing them. I can get them about 14 seconds apart but no closer and haven’t found a way to get in touch with the manufacturer on how to do it. The REAL problem is one unit loses time so as time progresses they get further apart. I wouldn’t think this would be a problem with a digital clock. Again, I haven’t contacted the manufacturer to see if this is a normal problem.